This is precious! Wow, I think I am in love. This is the type of baby stuff that I love. I am going to try to create some birds to see if It can be done. Oh I remember making hanger mobil when I was in elementary school. I was a pain to keep balance! Super whimsical! I wonder what she used to make the ring? 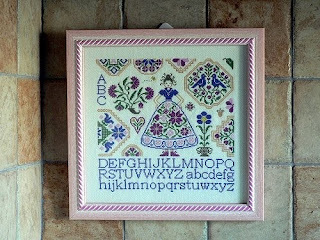 This is a pretty little sampler I found on flickr when looking for inspiration. I really like the colors she used. I unfortunately lost the link to the image. I think that I am really drawn to the floral designs. It was titled "My Quaker Lady". One day, I will complete one of these little samplers. The spacing is so nice I wonder if this was a pattern or an original design. Got a beautiful Birthday package that had a yarn cross stitch kit in it. I really like the colors that came with it. I have made little coasters so far. I also went to yarnbirds here in my home town. This was my first trip to this wonderful establishment. The shopkeeper was wonderfully helpful and very kind. I will definitly be back. Ill show what I have started soon! I made these hats for My hubby and I. It was my second and third attempt at hats. I looked at a quick beginning video by teresa to get started, but I winged the rest. Hubby wanted his beanie to be a little long. It ended up being a funny shape. I wanted mine to be full in the back. I am fairly happy. I am going to try again. My sister took these pics of on my birthday. She got a fancy camera for Christmas. Too many buttons though! Thanks! I did this to this pretty little topper. Gasp! My mom found the top at a yard sale and tacked a back on in the 80's. I don't really remember seeing it until high school and I left for college and took it with me. I know that the holes weren't that bad when I took it. Remember that the blacks and dark blues were being chewed up. I feel sad when I look at it. It is sooooo soft and the perfect weight, but it has terrible shredded fabric and the seams are coming apart so I am putting it up. It cant be washed! I cant believe that I did that! Oh I am ashamed. I know some of the fabrics are from the 40's. They feel like kleenex lotion tissue. (I know that is uber specific, but I am bit of a tissue snob) I don't think that I can fix it! Too far gone. I am going to have to create a replacement from the purple king size Mountian quilt scraps. (Blogging of, I pulled it out last week and ironed the blocks and strips and sized it up and figured out a game plan. I am finishing that UFO soon!) I am never gonna be able to make it soft enough! When my mom came to visit last week for my b-day we went to new a fabric store. My mom is very supportive and willing to do what ever I want (she took me and 3 other teenage girls to a bush/no doubt concert when I was 13! Wow!). I know she was not particularly into the fabric store scene, but she made the best of it. She picked out the kit/template by sew fun to make "baby brainy ball". The finished product seemed slightly daunting, but surprisingly it was simple. Mom picked out the cute fabric from the fat-quarter bin. She wanted them to give as gifts for co-workers. I also will make a few for the babies to come this summer. This was a fairly simple project until you have to hand sew the wedges together. A lot more hand sewing than I really wanted to do. 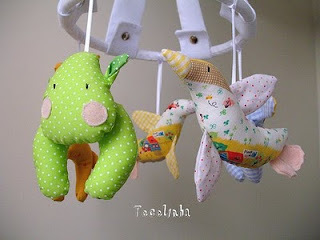 The end result is extremely cute and practical (gotta love machine washable, handmade soft toys!). I love the idea of mixing up the contrasting fabrics and textures! Think ill stuff the next one a little more. Can I put a bell in there? or does that make it a dog/cat toy? I also made this bag out of super cheap christmas fabric from Jo-ann's. For now it holds all of the christmas fabric for a quilt. It will eventually be given as a re-useable gift bag. It was an awesome B-day! 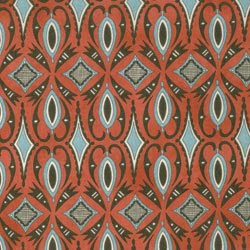 I want this Moda fabric. It would add a lot to my living room. Gotta love the orange! Pillows would be very nice indeed. I wish the fabric chain near my house would carry awesome stuff like this. I think I might have to drive a little out of the way soon to get me some. I hope to get a little birthday cash to buy some soon! Hey check out the new header my dad helped me with. He called it a Mast Head. He did a nice job with the colors. The plaid in the back is actually the tartan of my hubby's family. I really appreciated him doing this for me. I think it looks soooo much better. I like how he retained my original idea. Big thanks Dad! My family had a great milestone in January. 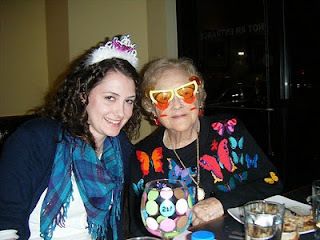 My sister (actually she is Dec.)and my g-ma had epic birthdays. (My hubby really likes the word epic and uses it way too much and now so do I.) Can you believe 90! 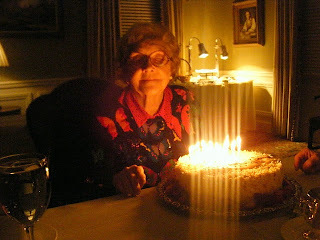 I know that my sis will make it to 90 too, if she can make it pass 21! We celebrate appropriately, with silly glasses and crowns of course! My hubby's parents live in Texas and are very proud of this. I can relate to this emotional attachment to my home state. 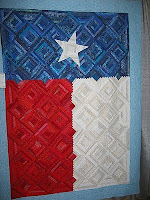 I have put a bit of thought recently into making them a Texas quilt. I have looked for Texas/Cowboy/Boots theme fabric. Mind you I live in N. Carolina. I have not found anything that would pass. I talked to my hubby about ideas for the quilt. I originally thought I would do a crazy quilt with Texas fabric. This is not looking like the easiest plan. I went on a search and found these beauties! I really love the first one, but I think the second one will be more similar to the finished creation. I have some time, but I like to think ahead on my projects!